Who’s Dropping in on Trump Budget Czar Mick Mulvaney? That's if you are a super-rich taxpayer! One of President Donald Trump’s top cabinet officials has met with a long list of lobbyists, corporate executives and wealthy people with business interests before the government, according to calendars the Trump administration fought to keep secret. The calendars for Mick Mulvaney, the former South Carolina congressman who now runs the White House Office of Management and Budget, offer a glimpse of who has access to the highest levels of the Trump administration. Among those visiting Mulvaney: Trump friend and casino magnate Steve Wynn; a flurry of officials from the conservative Heritage Foundation; a string of health care and Wall Street CEOs; lobbyists for Koch Industries; a cryptocurrency evangelist; and a prominent member of the Catholic group Opus Dei. The Trump administration fought in court to block public records requests by Property of the People, a Washington-based nonprofit transparency group, to release the calendars as well as visitor logs from several other White House offices. Lawyers for the group ultimately prevailed and provided the documents to ProPublica, which we are posting in a searchable format. As OMB director, Mulvaney is the driving force behind the president’s budget and influences regulations and government procurement. It’s been widely reported that he will become the acting head of the Consumer Financial Protection Bureau. He also has the ear of the president, who is reportedly a fan of Mulvaney’s performances on the Sunday political shows. The calendars, which cover February to September, typically don’t include details on what was discussed at the meetings. In some cases, the timing of contact with Mulvaney line up with OMB business. “The OMB director is a member of the cabinet and also a senior adviser to the president — because of that, the director often spends a ton of time in the West Wing,” said Kenneth Baer, who was senior adviser and associate director at the agency for several years of the Obama administration. The quickest way to get access to Mulvaney appears to be to hire his former congressional chief of staff, Al Simpson, who joined the lobbying firm Mercury in February. Simpson had seven meetings and a phone call with Mulvaney in a four-month period, between April and August. He appears on Mulvaney’s calendars more frequently than anyone who is not a current government official. Often, Simpson brought lobbying clients with him, including representatives from building materials giant Cemex; pharma firm AmerisourceBergen; and BlueCross BlueShield of South Carolina. Those three firms paid Mercury $360,000 in the first nine months of the year, disclosure filings show. A Mercury spokesman said: “The firm fully complies with all registration and disclosure requirements when representing clients.” The OMB press office did not respond to requests for comment. In July, Simpson and Koch Industries lobbyists Brian Henneberry and Raymond Paul met with Mulvaney. In other cases, billionaires themselves came in to meet with Mulvaney. They include Charles Schwab, medical entrepreneur Patrick Soon-Shiong and Wynn, the casino magnate whose relationship with Trump goes back decades. Wynn met with Mulvaney in April. Wynn’s firm has lobbied on tax issues on Capitol Hill. Wynn himself, who has large holdings in Macau, has reportedly been involved in pressing the Trump administration on China issues. Wynn was also named finance chairman of the Republican National Committee in January. Wynn’s spokesman declined to comment. In late February, Mulvaney had a call with Eugene Scalia, the son of the late Supreme Court justice and a prominent lawyer at Gibson Dunn. At the time, Scalia was representing business groups that wanted OMB to delay the implementation of a regulation known as the fiduciary rule. Scalia didn’t respond to a request for comment. Many of his meetings with health care executives came as Republicans in Congress tried to repeal Obamacare. Mulvaney met with few, if any, consumer groups. That’s in contrast to President Barack Obama’s first OMB director, Peter Orszag, whose visitor logs show meetings with both a long string of corporate executives as well as philanthropic and consumer representatives. Among the more surprising visitors to Mulvaney was Jeff Bell, a former Reagan aide who is marked on the calendar as being with the Catholic group Opus Dei. Bell told ProPublica that his March meeting with Mulvaney, a Catholic, covered “religious and political matters” but declined to comment further. Another was Valery Vavilov, CEO of Bitfury, a tech company focused on cryptocurrencies like Bitcoin. When Mulvaney was still in Congress last year, he co-founded a “blockchain caucus” to promote the technology behind Bitcoin. 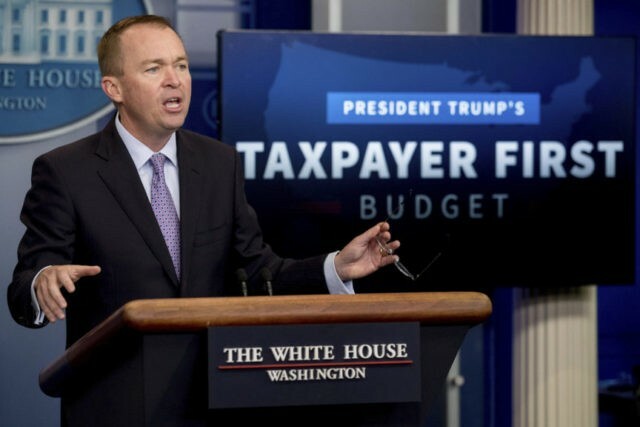 At the May meeting, “Mulvaney expressed his desire to encourage government use of blockchain and he asked our group for suggestions of simple use cases that could be a first step for government adoption,” a Bitfury spokesman told ProPublica. Do you have information about Mick Mulvaney or the Office of Management and Budget? Contact Justin at justin@propublica.org or via Signal at 774-826-6240.